5 exercises. Identify places. 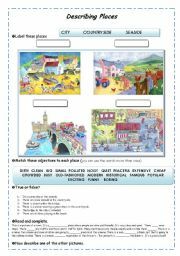 Match places with adjectives, true or false, complete a description and finally describe 1 of the places. 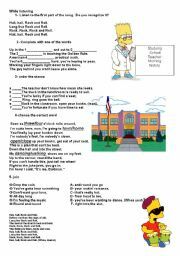 1st worksheet with the "before and while listening activities" after listening activities are in a 2nd worksheet (because of filesize) Great song to practice routine verbs and simple present. Hope you like it as my Ss do! The song is easily found with a p2p programme. Ss label the body parts with the scrambled letters and then they can cut the doll and make a puppet to play (tpr activities), It is better if they paste the ws on cardboard before cutting it. Book day! 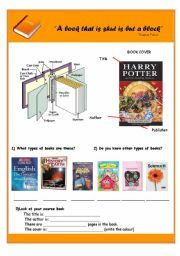 Parts and types of books. In my country we celebrate Book Day on the 26th May. 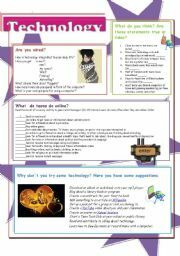 For that day I prepared this worksheet to learn the parts of a book and different types of books. 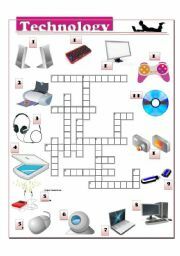 There are also some activities. Hope you like it! 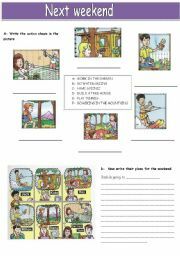 Match the actions to the pictures and then write about their plans for the weekend. Simple and useful.See you! Halloween is coming!! 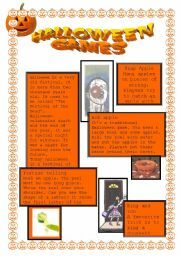 here you have a brief history of Halloween and the most traditional games explained. Enjoy, and have fun playing them!! Happy halloween! 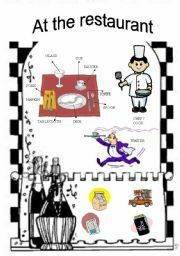 A nice worksheet to introduce the topic of restaurants with all the vocabulary needed showing nice pictures. A day in the life of Homer. (14 slides)Homer introduces himself (personal information), describes his appearance, his preferences, and then his routine. 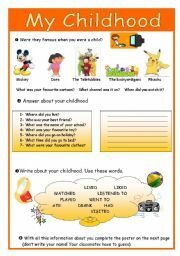 I use it as a model and then students prepare something similar about another character to revise routines and personal info. Hope it helps! !